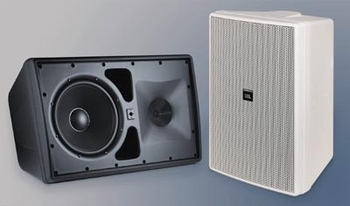 JBL Control 30 Surface Mount Speaker DJParts - All Variety of Parts that DJ Needs.  Extended bandwidth, extremely smooth frequency response.  Fully outdoor-capable design, featuring WeatherMax™.  120° x 110° HF coverage.  150 Watt transformer for 70V or 100V lines, with 8Ω thru.  250 mm (10 in) fiberglass/Kevlar® cone LF woofer, with neodymium magnet coaxial 125 mm (5 in) anodized aluminum cone MR, and 25 mm (1 in) titanium diaphragm compression driver.  Includes InvisiBall® mounting hardware, plus ten 6 mm attachment points for suspension and optional U-bracket.  Sealed input panel cover and screw-down input terminals. The Control 30 utilizes high power components, computer optimized horn and coaxial component design, patent-pending cabinet manufacturing techniques, and a complex network to achieve smooth high fidelity performance, extended bandwidth and well-controlled, defined coverage from a compact loudspeaker. A symmetrical mid-high frequency horn allows use of the speaker in either vertical or horizontal orientation. Smooth frequency response and cone-midrange performance ensures excellent sound character throughout the frequency band, over the entire listening area. The top-quality line distribution transformer, designed for minimal insertion loss and reduced saturation, allows use of either 70V or 100V distributed speaker lines. In bypass position, the 8 ohm impedance allows use of multiple speakers on a loudspeaker line. The included InvisiBall mounting method is simple to install, aims easily and provides a high degree of theft deterrence. InvisiBall allows horizontal rotation of up to 41° off-axis and vertical rotation of up to 36° (horn end inward) or 23° (woofer end inward). Attachment points for the optional MTC-30UB (-WH) U-bracket allows for compact installation and is particularly useful for low profile underbalcony applications. Weather resistance has been maximized. The neodymium magnet LF woofer has a fiberglass and Kevlar composite cone, the surround is pure butyl rubber, and the basket is rear loaded to minimize exposure. The MR cone of the coaxial mid-high driver is anodized aluminum with a formulation EPDM rubber surround, and the HF compression driver’s diaphragm is pure titanium. The coaxial component is protected by an acoustically transparent screen. The grille is thermoset composite coated and stands up very well to UV as well as humidity. The grille is backed with our WeatherMax multi-layer foam, which prevents the direct incursion of water. Nickel/zinc rust-resistant terminals ensure a secure input connection. An MTC-PC2 sealed-entrance cover is included to further protect the speaker’s terminals. JBL’s exclusive SonicGuard overload protection is virtually inaudible to the listener, ensuring reliability while providing full fidelity sound. Available in black or white (-WH), the cabinet will accept a variety of paints to match any décor. Usable frequency response shall extend from 38 Hz to 17 kHz (10 dB below rated sensitivity, half-space, no external equalization). Rated power shall be at least 500 watts continuous program power for 100 continuous hours duration (defined as 3 dB above a test signal of filtered random pink noise conforming to IEC268-5). Measured sensitivity shall be at least 93 dB-SPL (at 1m [3.3 ft] with 2.83V input, avg. 100 Hz to 10 kHz). The input shall be switchable for use either at nominal 8 ohms, or on a 70.7V or 100V distributed speaker line via built-in transformer. Selectable taps shall nominally be 150W, 75W, or 38W on a 70.7V or 100V distributed line, plus 19W on 70.7V line only. The system shall be protected against damage from occasional overpowering via full range limiting, which shall be inaudible during activation. The coaxial mid-high driver shall be horn loaded to cover 120 degrees horizontal by 110 degrees vertical with a high degree of accuracy. The cabinet shall be molded High Impact PolyStyrene (HIPS) with ten percent glass fill, and a 5 mm internal foamed polyurethane secondary mold. The grille shall be backed by multi-layer foam and be secured via screws to keep it in place when facing downward. The cabinet and grille shall be paintable. The low frequency transducer shall have a neodymium magnet, a cone of woven fiberglass and Kevlar® and butyl rubber surround, with the frame protected from direct weather exposure. The mid frequency transducer element of the coaxial mid-high driver shall have an anodized aluminum cone with an EPDM rubber (a Terpolymer of Ethylene and Propylene) surround, with the frame protected from direct weather exposure. The compression driver shall be constructed with a titanium diaphragm for weather resistance. The coaxial mid-high driver shall be protected with a secondary acoustically transparent screen. The system shall withstand Mil Spec 810 testing with specified durations with no effect on its acoustical performance or structural integrity; salt spray (method 509.3), temperature (method 501.3 and 502.3), humidity (method 507.3) and ultraviolet (method 505.3). Further, it shall pass Mil-Std-202F (method 101D) for salt spray. They system shall have an IEC 529 splashproof rating of IP-X5. For theft deterrence, the installation access area shall be hidden behind a snap-out cover on the front grille. The included ball mechanism shall be internal to the cabinet. The cabinet shall have ten (10) 6 mm mounting points including 3 on each side and 3 on top and bottom and an accessory U-bracket shall be available. The grille logo shall be rotatable for proper orientation with loudspeaker mounted horizontally or vertically. The external wiring connectors shall be screw-down terminals. Overall cabinet dimensions shall be no greater than 593 high x 372 mm wide x 345 mm deep (23.3 x 14.6 x 13.5 in) and shall weigh no more than 18.9 kg (42 lb). The finish shall be lightly textured black or white.